Smaller is easy. There is still an abundance of 17", 14" and 8" 15khz rgb monitors and, with some exceptions, they are still cheap as they are less desirable. For example, this 1702 going for $100 plus another $100 for shipping and you get the Commodore 64 with it... I don't think that monitor has RGB though. I don't think a commodore monitor is the way to go for an authentic arcade experience. Not all Commodore monitors are the same. The 1702 uses an A tube (vertical phosphor stripes, slotted mask) while the 1084 uses an M tube (dot phosphor pattern, circular hole mask) like a PC monitor. The difference is pretty evident. An A tube will look like this JVC monitor. Most arcade monitors were either 19" (visible) or 25". My old favorites like double dragon, final fight and SF2 never looked or felt "arcade-like" on anything smaller than 19". 14" (13" viewable) is definitely an arcade size. It was used in cocktail cabinets. We'll have to agree to disagree on this one. The 1702 doesn't have an rgb input does it? I'll concede that not all Commodore monitors were the same. Some were average and some were way worse. None of them could be considered a top 10 choice for vintage arcade gaming. There is a reason why there are so many still available on eBay... I put up with one temporarily back in the day until I could afford a Sony Trinitron tv for my room. While I'm not one of them, I can understand the group who like the Sony BVM look. I can obviously understand the people who like real arcade monitors and consumer CRT TVs with nice 19" and 25" screens. I will never understand the group that recommends tiny low end CGA monitors from the Commodore 64 era. They were not considered desirable even in the 80's. It is true that, occasionally, smaller monitors were used with arcade games. I don't remember cocktail cabinets using screens as small as 14". There were a few novelty bar top arcades with 14" CRTs but you would never ever find one in a real arcade. You found them in pubs to use while you waited for your pint. Can someone recommend me a monitor that does not have apparent scanlines like this JVC? Most little RGB monitors with a good CRT look like this. I like it too. In Australia a 14" monitor was a common size for cocktail cabinets. Some upright cabinets had them too. I bought a Lowboy (kid size, very common) cabinet several years ago that had a 14" vertical monitor fitted. The 1702 doesn't have RGB but has an arcade type tube. The 1084 has RGB but doesn't have an arcade type tube. If you're going for an authentic arcade experience neither is accurate. The 1084 isn't less arcade authentic than the Ikegami you praised in another thread though. It is true that, occasionally, smaller monitors were used with arcade games. I don't remember cocktail cabinets using screens as small as 14". There were a few novelty bar top arcades with 14" CRTs but you would never ever find one in a real arcade. If a "real arcade" is an arcade of the 90s you would be right but in the 80s they were quite popular. Many classic games had a cocktail version: Pac Man, Donkey Kong, Q-bert, Centipede, etc. and they had 13" monitors like Electrohome G07, Sanyo EZ, Wells Gardner 4700, etc. And I've read that you like the Hantarex Polo, well there is a 14" version that is pretty common at least in Europe. So I confirm what I said above, 14" (or 13" vieawable) is an arcade size. Where we seem to agree is that it's too small, I also don't want anything in that size for that reason. Australia? Like that's even a real place... Next you'll be telling us about the monitors in Narnia? 14" arcade monitors were most definately not common in Europe (where I lived in the 80's and 90's). Cocktail cabinets were only common in hotels and bars (but not that common thankfully). More importantly, if an arcade mainly had 14" monitors in their cabs, I would have gone to a different arcade. There is no effective difference between a CGA arcade tube and an SD consumer crt tv tube. In fact, some are even interchangeable. In Europe, where most mid to high end TVs had RGB scart sockets, we were able to play jamma PCBs at home (with a supergun) without any scan or color space converters. A key feature and a necessity for an Arcade monitor is an RGB input though. That is also a necessity for any retro games monitor that deserves a recommendation for 240p mame. If you have to use svideo or composite then almost any decent consumer CRT tv is a better option. If the point is that the type of mask is what makes it an "arcade type tube" or not, I think you are overestimating the importance of the mask for this topic. Sony Trinitrons use the same style of mask but, the image looks completely different on an RGB consumer Trinitron tv to a PVM or a Trinitron pc monitor. It's the pitch size, tvl capability, bloom and contrast that matters. The rgb image on a consumer Trinitron actually looks very arcade-like. You can see a small difference up close but it's still closer than any pro grade rgb monitor. Gaps between scanlines are not visible at normal playing distances etc. Similarly, the shadow mask on my broadcast monitor looks nothing like the shadow mask on my arcade monitors. 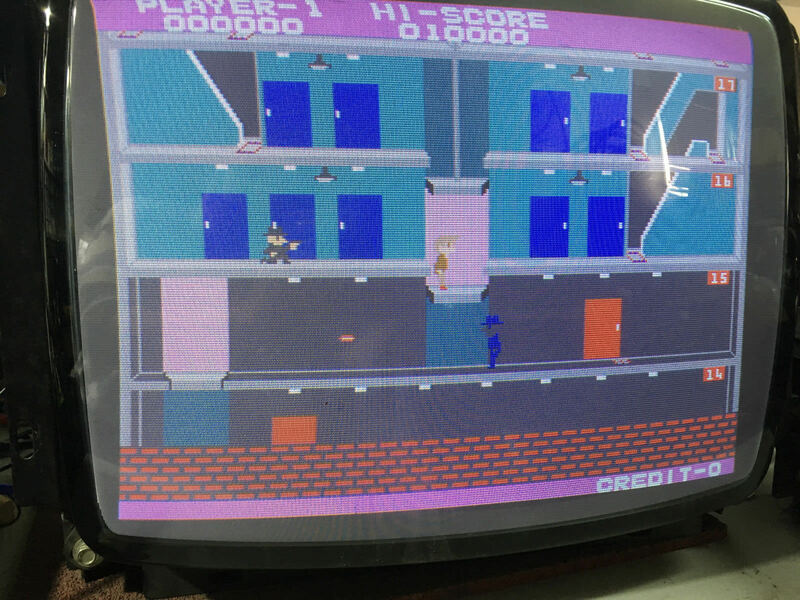 Let's all agree that we in the retro gaming community will no longer mention Commodore monitors when people ask for recommendations unless they are specifically looking for an authentic Commodore 64 experience. Yes, my Sony Wega looks like an a real arcade monitor (240p component), and the JVC monitor looks amazing too. Someone mentioned this already, but what you're looking for may be much simpler than you think. Just find any CRT in a size that allows you to sit away far enough from it while being comfortable to look at. 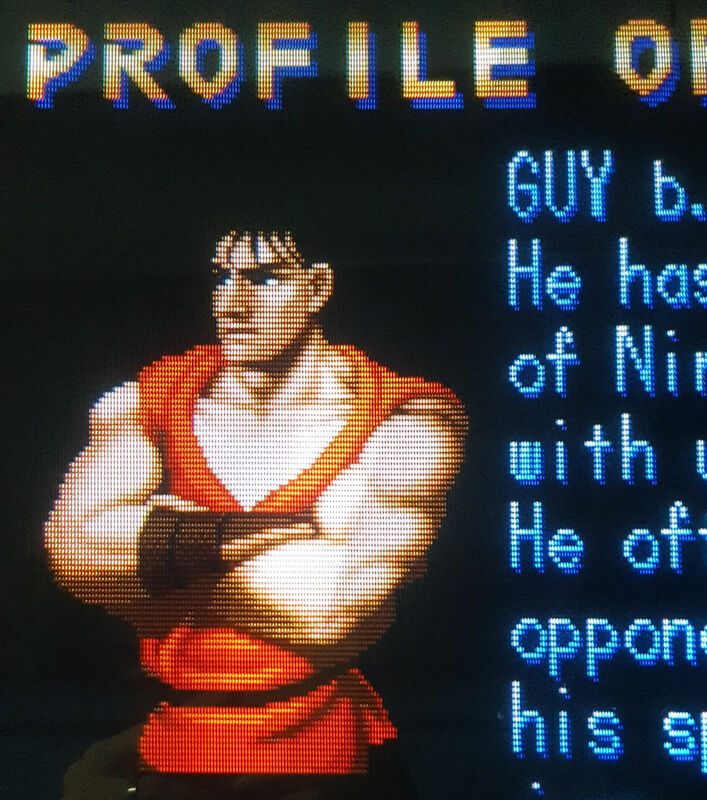 Even on the hated Sony BVM scanlines are not noticeable if seen from enough distance (and additionally you get all the benefits of a BVM such as sharp image, incredible colors and contrast, etc.). This of course implies that recreating the arcade experience does not involve sitting with your face a short distance from the screen. Just wanted to share a pic from a member here of his consumer Trinitron set. I really like it, it has a nice amount of blooming, not a high TVL count. Beautiful grain to this picture. Here's something I was screwing around with awhile back when I was experimenting to replicate older monitors. If you dial back the actual scanline strength a bit, you can actually mirror the old monitor effects on the ossc now. Shame aside from my setup you need an actual firmware update to do this. I am not an alcoholic, I'm Drunk! Alcoholics go to AA meetings. I've been seeing this pic going around and the thing that bothers me is that the PVM image is clearly using RGB. Try one of PVM usingng composite and, especially when seen from a normal distance, it won't be any different from "What retro games actually looked like" (just a bit sharper and with better colors of course). Now this looks really interesting! I want to see how this will look on a 4K OLED. Just for fun I thought I'd compare my image to the one posted. I sure hope Bob doesn't get the impression I'm competing with him or anything. This would be the definitive scanline/crt effect for the OSSC. The picture of Link is mine and taken out of context. All are blurry and you can't see the individual lines on the BVM. I have pictures somewhere of the World Heroes title screen across all those CRT's, plus an actual arcade monitor that shows the difference. All are EXCELLENT and the 1000-line BVM looks stunning. Still, they're all different, so people should just use what they're eyes prefer. The only "wrong" answer is telling people something is "bad" - All preference, all excellent choices. What retro games actually looked like depends heavily on where you lived, how good your TV was and how you connected it. I am sure we all owned lots of TVs and every one looked a little different. The hyper visible gaps between scanlines on the BVM and PVM has far more to do with the pitch and limited bloom than whether the user chose SVideo or RGB though. A high end broadcast monitor has thick scanlines even with SVideo and composite. When I was a kid, my Master System, SNES, Megadrive, Neo Geo and PS1 were all connected to consumer TV's through RGB and it never looked like a pro broadcast monitor. Using RGB made 16 bit consoles look a little more jagged because of improved color seperation but I don't remember being bothered by excessive scanlines. While that isn't under a microscope like the other images shown, it is still far closer than a normal person would ever sit. It's the contrast and dynamic range where high end displays really excel. It makes more of a difference than resolution sometimes and CRT tech was particularly strong in this respect. Only bettered recently by OLED. We never saw pronounced scanlines in the arcades of the 80's (that is something objective), you could see those thick lines of bvm at 1 km of distance. A lot of monitors used back in the 80's didn't do a great job of separating the lines, but instead we had all manner of vertical lines produced by the various types of raster arrays that was common in each monitor. Sprites were fuzzy and all this lead to them having a specific character to look like sprites instead of lego blocks trying to impersonate an image. It's funny when I look at lcd's trying to upscale and we complain about the games looking way worse, but honestly if we could throw in those raster lines, the graphics wouldn't look hardly that much different. Last edited by headlesshobbs on Wed Dec 05, 2018 3:54 am, edited 1 time in total. Even on that arcade monitor scanlines look rather noticeable to me. In any case, rather than how stuff looked like to us in the 80s or 90s, if time and budget allows I don't see why not go for the best possible picture quality attainable. The nostalgia does not reside on picture quality anyway, but on the gaming experience and graphical and musical styles characteristic of games of those decades. I don't remember anyone talking about scanlines until emulation became popular. I was more than your average gaming fan and I never heard the term until emulation on flatscreens. The reality is that as kids, we never looked for them but they were most certainly there if you did. I have old arcade boards and old arcade monitors here and you can easily see scanlines if you look for them and, the way the old boards look on screen is identical to what you get from Groovymame. Scanlines are inevitable if you display a 240 line image on an SD display designed to display 480 lines. If you display. 480 line image on that same screen, scanlines will vanish. The issue with the image on hd LCD displays is the scaling, not the lack of scanlines. Without a quality scaler, the effect is similar to taking a tiny thumb-nail jpeg image and zooming in until it fills your 1080p monitor - the larger it gets, the more pixelated it becomes. LCD panels have to scale 240p to their native res. CRTs switch res to match the source. If you could find an LCD with a native res that matched your 240p game, it would look good. 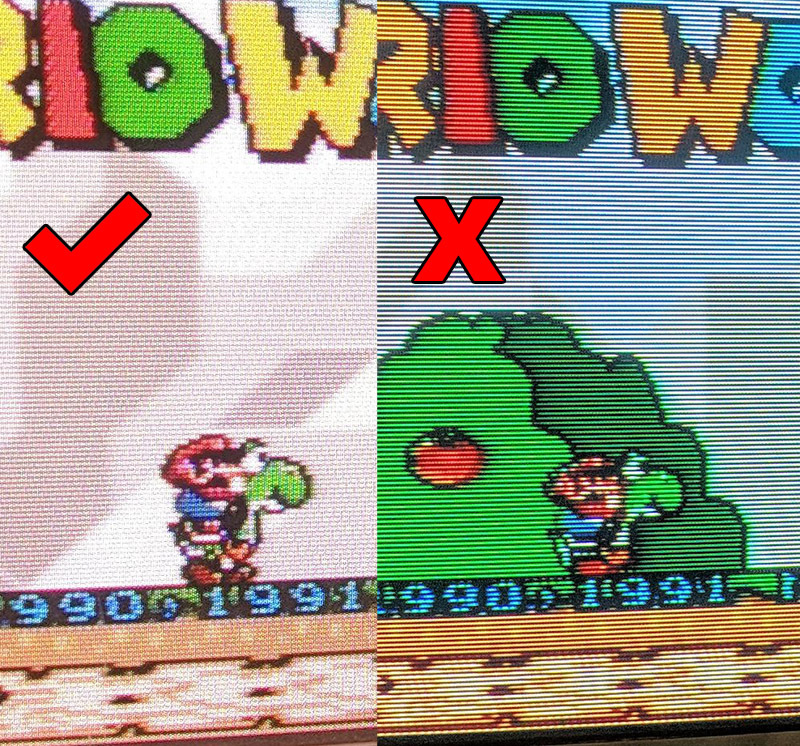 Btw, The date on that Sony Trinitron that I posted pics of (showing scanlines through SVideo) is 1992.